1 of 1 For each serving, spread 2 teaspoons mustard over a toasted bun. Arrange tomatoes down one side of the bun and cucumbers down the other side. 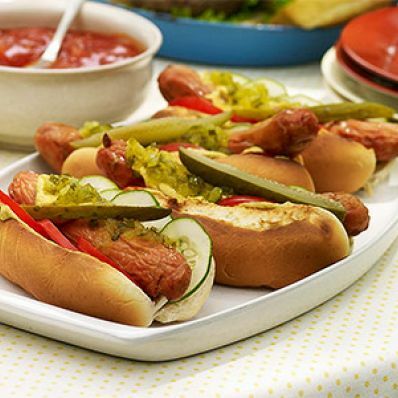 Add hot dog and sprinkle with celery salt. Top each with 1 teaspoon mustard, 2 teaspoons relish and a piece of pickle.